If you walk onto a business property and the sidewalk is stained or covered with mildew or bubblegum, you tend to make an impression of that business. Well so do your customers. Your driveways and sidewalks may be the first impression that you have of a company so make a good one with a commercial power washing of your business premises. Our services are ideal for sidewalks, commercial garage spaces, storage areas, parking lots and loading docks. Our professional cleaning team will come to your business location and make you proud. We will ensure that all of your concrete surfaces have a professional appearance. Concrete is one of the hardest things to clean due its pores nature. It absorbs tree sap, dirt, minerals, and rust that sink deep into the surface. Because concrete replacement is expensive, it makes a lot more sense to clean your driveways, patios, sidewalks, commercial garage, loading docks, parking lots and any other commercial concrete cleaning before it suffers deterioration from the elements. Commercial power washing will bring your facility back to life! In today’s business environment you need to hold all advantages and look the best until you are. Your business image starts at the parking lot so let our team of commercial concrete cleaners give you an advantage over your competitors. Your building or parking lot will benefit from having your facility professionally power washed to remove oil, mold, dirt, pollen and any other contaminants. Call us today for an estimate from our trained team of professionals to clean you concrete surfaces. Cincinnati Power Washing is a full service residential and commercial concrete cleaning company that is fully insured and bonded. We can even clean the algae off of roofs. Our choices of eco-friendly cleaning products also assure that your landscaping, your staff, and your customers will all be safe. Don’t lose customers because you need commercial power washing. Call us today for an instant quote. If you are a local business owner in the Cincinnati, Ohio area, you know how irritating and frustrating as well as challenging it is to remove chewing gum that has been tossed on your sidewalk or concrete area. What kind of sidewalk cleaning can you perform to remove the sticky, gooey mess? Cincinnati pressure washing seems to be one of the best ways to remove baked on, walked over chewing gum. In this short guide, you will be informed of the top three tips to remove chewing gum with power washing. The most critical advice when eliminating stuck-on chewing gum from a concrete surface is to use heat. Just as heat sears on roofing materials and heat repairs seams of gutters, warmth is beneficial with power washing. Most individuals think that the pressure of the water hitting the chewing gum removes the substance, but that is not true. What actually removes the black gum from your sidewalks is the heat that is applied. Cold-water pressure washing will etch the concrete causing it to be more susceptible to future damage. It is also imperative to remove the gum as soon as you see it because gum that is left for an extended period can stain the surface. Due to the acidity in the saliva of the gum as well as the chemical makeup of the chewing gum, if left on the porous concrete, it can etch the concrete surface causing it to be more fragile and susceptible to the environment. The next most crucial tip when removing chewing gum with Cincinnati pressure washing is to use the appropriate tools. Since power washing is the most efficient and reliable method to remove the sticky substance, you want to make sure you are going about it correctly as you do not want residue or a stain left. Just as a technician knows an HVAC system or a painter knows painting, you too must know your tools. You are going to want to observe your pressure washer for the size dictated. It should state the rating, which is something like five gallons at 5000 PSI (pounds per square inch). The PSI is the energy with which the water will hit the surface you are cleaning, and it is imperative to the proper completion of the task. Know your equipment ahead of time and if you have any difficulty, or are lacking the knowledge needed, call in the professionals to assist you with your cleaning. The last essential tip when using pressure washing for sidewalk cleaning and chewing gum removal is to have an efficient method of performing the task. If you are not capable of performing the cleaning, make sure you hire an experienced local handyman or professional commercial power washing team to complete the work for you. If you are performing your own job, your tool of choice in completing the task at hand will be the correct nozzle. Always use a higher flow nozzle when removing chewing gum. You want to use the nozzle in a careful circular motion at a distance, as the pressure does not remove the gum, the heat does. As you can see, there are a few excellent tips to remove the sticky, gooey clump from your well-used sidewalk. Whether you use Cincinnati pressure washing or another form of sidewalk cleaning, if you follow our advice on the top three tips to remove chewing gum with power washing, you will have the shiniest and cleanest sidewalks on your block! When it comes to removing hard stains from concrete, it can become frustrating, overwhelming, and challenging. If your Cincinnati place of business has food grease stains, you know how hard they can be to resolve. 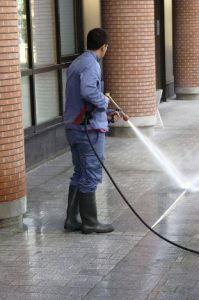 One of the best ways to perform concrete cleaning is with pressure washing. Cincinnati power washing will strip the grease stain permanently. In this short guide, you will be informed of the top four steps to remove food grease stains from a concrete surface. The first and one of the most important steps in removing grease stains from the flooring is to sweep up any debris such as dirt, food particles, spilled juices, or other debris. Just like with painting, which sometimes requires a primer, to get the stain fully out, you have to treat the entire area. You do not want to miss a portion of the area to be cleaned because something was sitting on a portion of the stain or food was covering up the area. Use a broom and dustpan and then a clean cloth to wipe off any remaining particles. The next step in concrete cleaning is to apply chemicals to the stain. This remodeling process allows the chemicals to dissolve and break apart the oil residue of the food grease stain. Make sure to check with local government before putting harsh chemicals inside a kitchen near food or where it is cooked. The chemicals need to sit for a bit to do their job; overnight is usually a good amount of time for the application process. The next step to complete the removal of food grease stains after the area has soaked for a good amount of time is to scrub the area with a bristle brush. You are going to want to use a stiff brush and you need to apply a lot of hard work. Make sure you are really scrubbing the area to get the best results. Use a grid type pattern to make sure you are not scrubbing the same area twice and wasting your time; you do not want to miss any spots. If you are performing the scrubbing outdoors near a rear door on the way to the dumpster or HVAC area, you need to use stronger chemicals and tools that are more powerful. Again, check with local government on the strength of the chemicals you can use at your facility. The last step to get rid of stubborn food grease stains is to use Cincinnati power washing on the area of need. If you are indoors, use hot water and power wash the floors with a cleaner with a vacuum attachment. The suction from the vacuum will draw out the stain as well as remove the contaminated water while placing it into a nearby drainage system approved by your facility for use. If you are power washing outdoors, much larger equipment is used with more pressure and suction. If you are not inclined to perform this task yourself, check with a local experienced handyman or contact a professional power washing company. As you can see, there many steps to perform concrete cleaning that will remove the ugly stain from your business. Cincinnati power washing seems to be the best way to remove the food grease, but many of the other steps are necessary to get the stain completely out and keep it from returning. If you follow our advice on the top four steps to utilize to remove food grease stains from a concrete surface, you will have the best-looking floors in all of Cincinnati! The holidays are upon us, and that means family gatherings, eating turkey, and being grateful for all we have. One of the things you should be thankful for is your Cincinnati, Ohio, home. It is crucial to keep that home in good repair for the years to come, and one way to do that is to perform Cincinnati power washing on the exterior of the house. In this short guide, you will be informed of the top five reasons you should power wash your home before Thanksgiving. One of the most important reasons to perform exterior cleaning of your home is to impress family and friends who stop over for the holidays. You want them to enjoy their stay, and that starts when they pull up to the house. Who wants to see and stay at a home with green moss and grime on the front? It gives the feel of a dilapidated house, and that is what you are trying to avoid. Your family will be impressed with the shiny new look of your home for the holidays! A huge reason to complete exterior cleaning on your house before Thanksgiving is because of what the day means. Thanksgiving is to stop and be grateful for all you have in your life. This includes items like your house that you have worked hard to purchase and maintain. Shine up that old house with a pressure wash, and it will look brand new again! Exterior cleaning of your home removes mold and mildew that can be harmful to family and friends. Some members of the family may have allergies, and mold growing near the door when they arrive could trigger their allergies and health problems could ensue over the holiday. 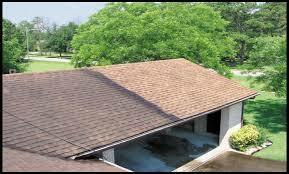 Pressure washing and cleaning the gutters before guests arrive will remove the grime and debris safely and efficiently. Renting a power washing machine is usually a little cheaper in the wintertime because not a lot of people are thinking about pressure washing in the colder temperatures. It all depends on where you rent the materials, but if you shop around, you can usually find a good deal. 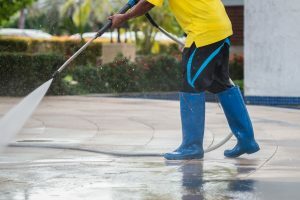 If you elect to call in a professional Cincinnati power washing team to perform the task, you may get a deal from them as well due to the time of year. It never hurts to ask! The last reason to power wash your home before Thanksgiving is because the temperatures have not gotten below zero yet. You do not want to power wash in the heart of the winter as ice and moisture retention can occur. If you can power wash the beginning of November when temperatures are still milder, possibly when HVAC maintenance, roofing repairs, or other handyman services are being utilized, you can have a home that will be inviting to holiday guests. If you wait until Christmas, you will have missed your opportunity, as it will be too cold at that time! As you can see, there are multiple reasons to perform Cincinnati power washing on your home before the holidays arrive. Whether it is for the health of your family, the cost, the gratitude you feel, or for vanity, your home will be shiny and inviting to all the family members who will be coming over for the holidays. If you follow our advice on the top five reasons to power wash your home before Thanksgiving, you will have the best turkey day in all of Cincinnati! A wooden deck is a wonderful addition to any Cincinnati, Ohio home. The tricky part of having a wooden deck is the upkeep that is required, specifically deck cleaning. House washing and power washing the deck are needed services to remove dirt and grime build-up as well as keeping your home in good working condition. In this short guide, you will be informed of the top four tips for cleaning your wooden deck. With a patio or deck surface, we start out minimal with a table and chair and maybe a potted plant. And then life happens. The kid’s toys are left on the deck, the garden hose is coiled in the corner, painting supplies are left out, the roofing shingles are in a heap, and random other items are left about on the wooden deck. Before you can perform any kind of cleaning to the deck, you need to move all the unwanted items from the deck to their respective places in the garage or shed. The next task you need to accomplish before deck cleaning can begin is to inspect the wooden deck for any repairs that need to be made. Examining the deck is similar to inspecting the gutters or the chimney. Repairs may be required on any of your home systems. With the deck, you are explicitly looking for loose planks, nails that are starting to come out, splintering of the wood, or any wood rot or termite damage that you notice. It is imperative that you fix these issues before cleaning or sealing the deck because if you proceed without repairing the items, the wood may be damaged further and can end up costing you in the end. 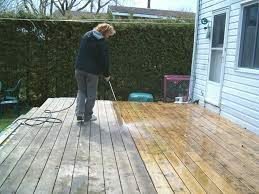 The next crucial tip in cleaning your wood deck is to power wash the area of any grime and build-up. Just like house washing, deck cleaning needs to be done meticulously, so you do not miss any spots. You want to make sure you take your time and perform the job carefully as pressure washing a deck can be difficult. It all depends on the amount of pressure that is applied. If you use too much pressure, you can damage the planks, causing splintering. If you do not apply enough pressure, you do not get a thorough cleaning, and the grime and dirt remain. The last and most crucial step of the entire process is to apply sealer to the wooden deck once it has been rinsed and dried. 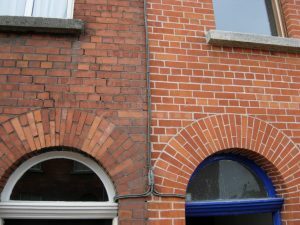 You can hire a local handyman to perform this task if you want, but it is straightforward to complete. Make sure you have purchased the correct sealer for wooden decks and then apply the sealer with a sprayer. You can also use a brush to get into tight spots such as corners. The sealer can be expensive, but it is well worth the cost to have your wood sealed in so less damage can come from the weather, sunlight, and insects. As you can see, there are multiple steps in the process of deck cleaning. Just like with house washing, you need to prep the area first by making repairs and moving unwanted items before you can perform the pressure washing of the deck. Lastly, make sure to seal in your hard work. If you follow our advice on the top four tips for cleaning your wooden floor, you will have the cleanest and most preserved deck on your block!